Took Larry, Steve, Chris, Clint, Jim and Joe to the Hudson for an open boat canyon trip on Sunday. We left late due to the weather forecast and when we reached the canyon we setup for the night chunk immediately at 6 pm. It was quiet for an hour before we had a flurry of long fins go thru and the guys landed 2 for 4. Nothing further happened until 10 pm when Steve hooked up on what seemed like a shark and not a vibrant runoff typical of a tuna. However after 30 minutes it was clear that he was hooked up to a swordfish because he was still losing line and it remained deep and circling. After the first hour the fish was still winning and after 2 hours we began to see color. 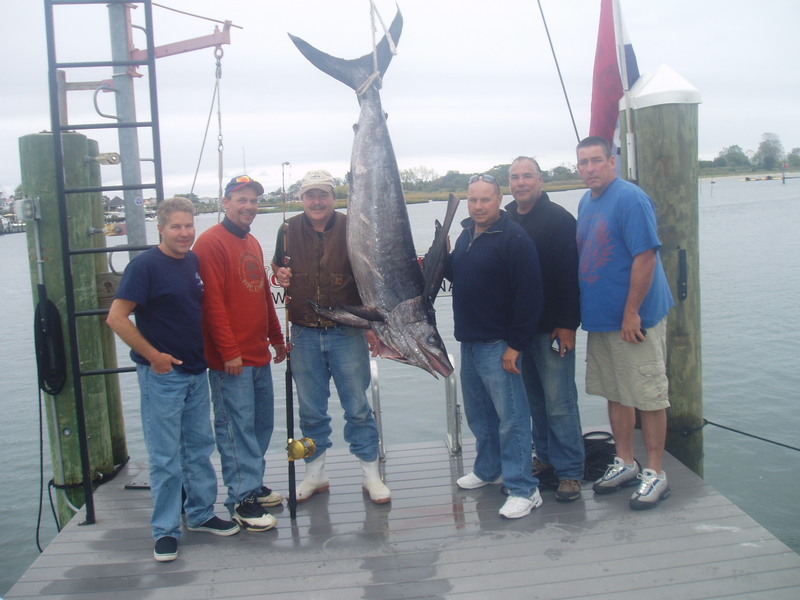 At 12:15 we harpooned a swordfish that we thought was close to 200 lbs. We weighed it at Hoffmans on the way in and it weighed 175 lbs. The rest of the night was quiet except for 4 mahi which the guys put on ice. At 9 am we trolled toward home with only a few lines off the transom due to heavy weeds. We had a single skipjack bite before steaming for home. Great weather with good fishermen and good eating to come.